By Mark Nobes - 11th Dec 2016. Additional material added on 12th Aug 2017. For this post, I have gathered together an array of 80s fashion photos from 1982. 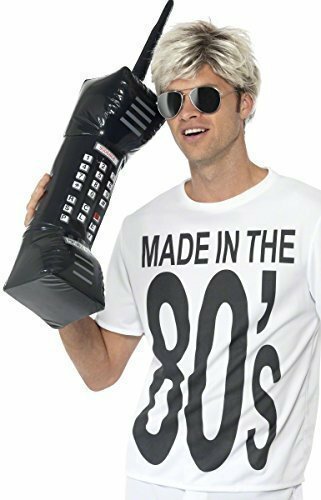 So whether you're here to gain inspiration for an 80s costume, or you're just curious about what people were wearing back in the day, I'm confident that you will find something of interest here. 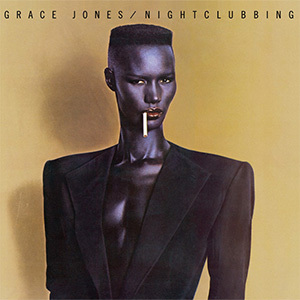 This album was released in 1981, but the iconic cover represents the early 1980s perfectly. Power dressing with shoulder pads became popular with the new breed of career women who were moving out of the kitchen and into the office. The term "power dressing" originated in the late 70s, but it was during the 80s that it became well established. Androgynous tailored suits and jackets with padded shoulders were combined with more feminine jewellery, scarves and high heels to create a professional, authoritative look. 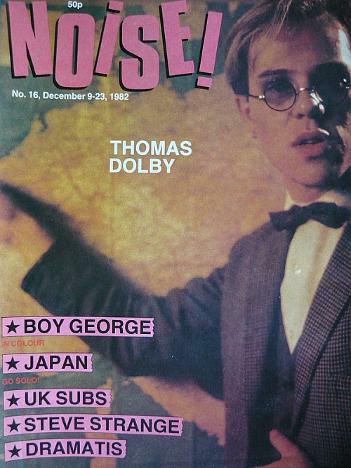 Thomas Dolby adopted an eccentric science teacher look and released the electro funk single "She Blinded Me With Science". In the early 80s, just about every teenage girl suddenly started wearing thick, footless socks over their jeans. 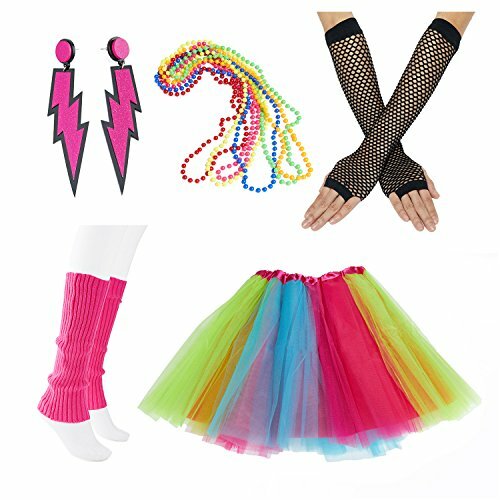 Better known as leg warmers, they were worn with just about everything, but particularly with leggings and tights or, as mentioned, over jeans. It was an aerobics craze that was responsible, and this was started by Jane Fonda's 1982 Workout Video and films such as Flashdance and Fame. This sewing pattern from 1982 features a very fashionable over-sized blouse with batwing sleeves and belt. Baggy jumpers and loose shirts were often worn as dresses and were sometimes worn off one shoulder. Big belts worn around the waist (they were often neon or white) became very trendy. My gran was very fond of knitting, and every Christmas she would present me with an Aran sweater which I was forced to wear over the festive period. She was a "loose" knitter and it was always two sizes too big. In fact, it looked like it had been knitted for an orangutan, with the arms going down to my knees. My gran would fiddle around with it for about half an hour trying to make it fit, and then would smile and say "Don't worry, you'll grow into it". The early 1980s also saw a change in our taste for Christmas decorations. The paper tissue decorations of the 70s were being replaced by modern foil decorations. 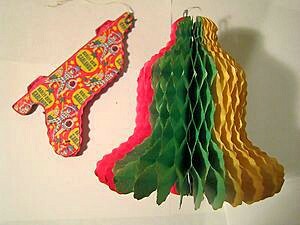 I was actually quite fond of the paper decorations, and they were more eco-friendly, too. In fact, we've decided to go back to using them (although using less ghastly colours) by making our own paper chains. I remember that some of the decorations came in pretty bizarre colours such as pink, yellow and orange, which were not very festive at all! Pop stars of the day were adopting all kinds of weird and wonderful fashion styles. Here we see Haircut 100 donning rather camp nautical outfits. 80s pop band Duran Duran were leading the way with nautical stripes, and helped popularise them further with the release of their Rio video. Altered Images lead singer Clare Grogan chose to wear a blue and white polka dot top for her photo shoot with Kicks magazine. Polka dots rarely go out of fashion, and they became particularly popular around the mid-eighties when Princess Diana wore a range of bold outfits featuring them. As you can see on this 1980 single sleeve, there was certainly nothing new about pop stars adopting either polka dots or stripes. Although he's not wearing them in this picture, lead singer Sting was also partial to nautical stripes. In the jungle, the mighty jungle, polka dots, vertical stripes and headbands were order of the day for the 80s novelty band Tight Fit. Someone should have told this girl to go steady with the blusher! Yes, big hair and bold make-up were very much part of 1982, although I certainly can't remember any girls wearing bow ties! This was also the year when an aerobics and fitness craze swept the nation with ladies everywhere going crazy for leotards, headbands and leg warmers. 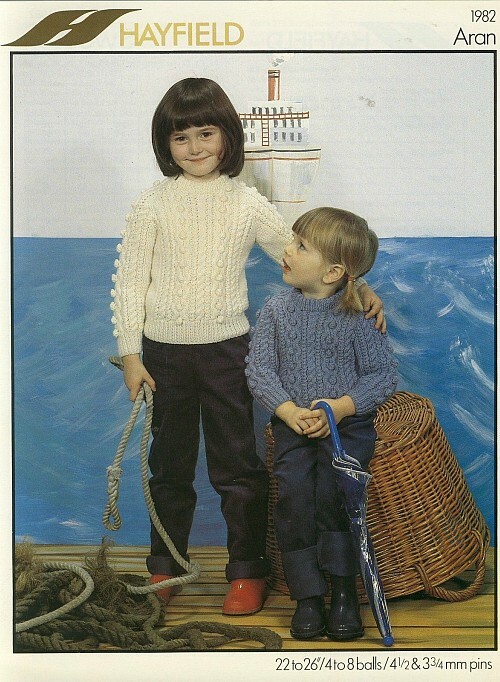 Patons knitting pattern from 1982. 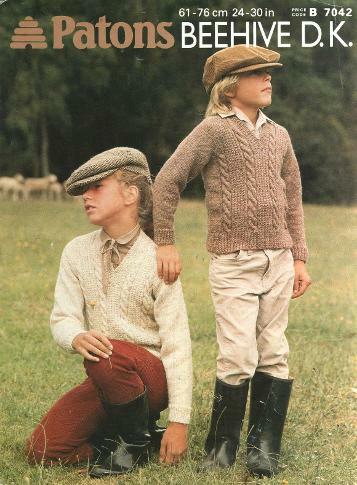 Okay, so if you lived in the Cotswolds then you would just about get away with this look. However, it would take a very brave person to walk down any high street looking like this!